The Hickory Kettle Grill Cover from Classic Accessories is made from durable Weather10 material featuring a rugged fabric outer layer with a laminated waterproof and wipe-clean inside coating. Weather Leather trim looks authentic but wont rot. 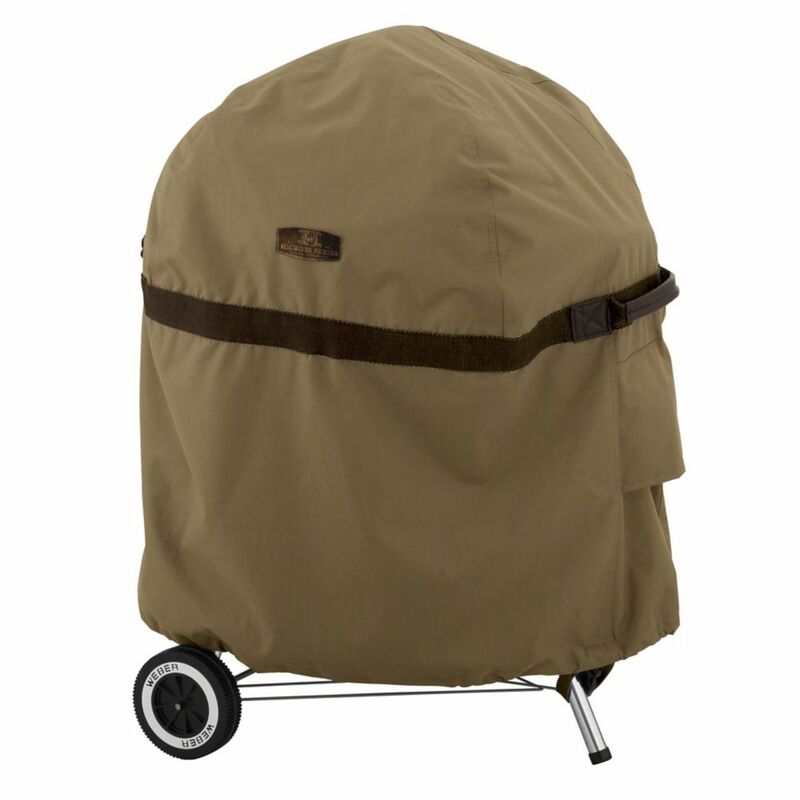 Covers kettle BBQs up to 26.5 Dia x 38 H.
Hickory Kettle BBQ Cover The Hickory Kettle Grill Cover from Classic Accessories is made from durable Weather10 material featuring a rugged fabric outer layer with a laminated waterproof and wipe-clean inside coating. Weather Leather trim looks authentic but wont rot. Covers kettle BBQs up to 26.5 Dia x 38 H.
Hickory Kettle BBQ Cover is rated 4.6 out of 5 by 7. Rated 5 out of 5 by James from This grill cover is attractive and well constructed. It... This grill cover is attractive and well constructed. It was highly recommended by my sister-in-law who bought one for her charcoal grill after finding her gas grill cover outlasted covers from other manufacturers. Fits our new Weber 22” very well. I like the bottom straps with heavy plastic clips to keep it securely attached in strong wind. Rated 5 out of 5 by Lrs125 from Great grill cover!!! I found this cover online and decided to buy it as it matched my backyard umbrella cover perfectly. The material is strong and protects my stuff from the elements. The handles on the sides and drawstring at the bottom are features I didn't know I needed until I had them. This cover is pricey, but well worth the money. Rated 5 out of 5 by Gr8attp from Great quality If you are looking for a hefty quality grill cover this is it. The last Classic Accessories grill cover we had lasted 5 years. I am expecting the same or more from this one. Rated 5 out of 5 by John from Great Cover for my Barrel Smoker. My Pit Barrel cover did not last long in the New England weather, it was very brittle and had holes in it. I needed a new cover for my Pit Barrel Smoker and this cover did the trick. Make sure you get the dimensions of the item that you want to cover. The Hickory Kettle Grill Cover has a nice thickness to it almost like canvass has nice handles and air vents that are attached. It also has snaps and pull ties to help tie down and secure the cover to your grill. This is my second grill cover that I have purchased from Classic Accessories they sell great durable products for your outdoor items at a reasonable price, plus great customer service. Rated 2 out of 5 by Don from I Wish Your Specs were Correct 2.0 out of 5 starsFar too small for the Weber 26.5 Kettle By Don C. Hampton on September 27, 2016 Verified Purchase The quality of this cover is excellent, HOWEVER, this cover does not fit the Weber 26.5 Kettle. It won't cover the bowl of the grill itself not counting the handles and the lid holder. My measurement of the circumference of the cover is 80 inches. Just to cover the bowl of the 26.5 grill requires at least an 84 inch circumference. The actual width of the 26.5 grill plus handles and lid holder is just over 32 inches. 32 inches wide requires an inside circumference of the cover of at least 101 inches. The cover falls far short of fitting, and especially comfortably fitting, the Weber 26.5 Kettle. At 80 inches it should easily accommodate the 22 inch Weber. Regrettably I am returning this cover. Rated 5 out of 5 by Donald from Excellent product for my 30 year old Weber No problem with the cover and it fit perfectly. Very high quality.